Creating, a walk thru life. Often, as we travel through life we are challenged to go an extra step. As my children grew I realized they would someday be on their own and that I needed to create a world where I could continue to travel while their lives went down a different lane. I returned to college and to growing in my creativity. I learned to communicate not only with others but with the inner being within me. I learned this being need to be free to grow and to always be challenged. In the 60's I learned to abstract from what my eyes saw to what my mind's eye interpreted. In the 70's I grasped many of the realities of life, while in the 80's I dealt with those realities and grew. In the 90's I have arrived at a crossroad and have made choices which would have been impossible at any other time, hoping that in the new millenium I will arrive where God has shown me the way to go. My grandmother started this quilt between 1905 and 1910. Many, (many?) 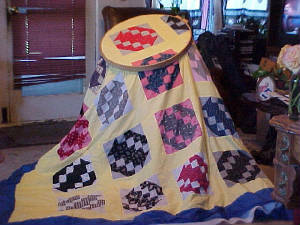 years ago my grandmother took me to my first 'quilting' in the church basement. 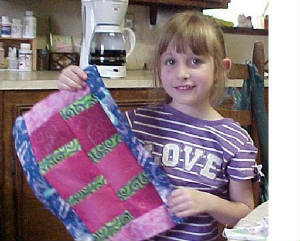 I don't think I was much more than 6 or 7 at the time but all the same I was hooked(sewn). As achild I learned todo anything I could with a needle and then discovered drawing. My grandmothers were two of the most influential and wonderful people in my development of my skills and so I suppose would have to be considered in any creative endeavor I attempt (including these pages). I hope you will enjoy your travels through my journey's as an artist and will share with me your thoughts. Angela is my 7 year old granddaughter and this was her first top she made by herself.